As a Hino dealer, you might know that we like to do it bigger and better than the competition. For the 2020 model year, our trucks are getting even bigger. With the XL series, you’ll be able to do even more with ease. Class 7 and 8 trucks that will lead the pack are here, with more power, better looks, and incredible technology. 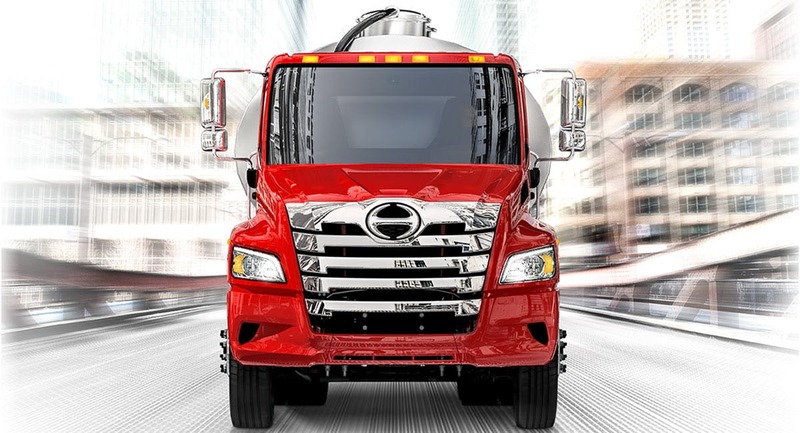 The Hino A09 diesel engine is the magic behind more hard-hitting power. While not new to our lineup, the A09 is what powers the Hino XL7 and XL8, and for good reason. Six cylinders, 300-360 horsepower, up to 1150 lb-ft of torque and a B10 life rating of 1,000,000 miles or 1,609,344 kilometres. 33,000-66,000 GVR? That’s right. The competition simply can’t stand up to quality like this. Why should your work truck have any less tech or safety performance than your car? It shouldn’t. With the XL series, you’ll find trucks that have ease and safety at the forefront. Steps that will grip to your work boots, extra wide doors, easy entry and exit. These trucks are designed to get you in and out of turns, deliveries, and work without hassle or hurt. Sometimes, even with XL trucks, the little things matter most. Beyond smart features, you’ll also find serious safety technology. The XL series has available collision mitigation that uses radar to prevent collisions with active braking; no matter what visibility is like to the human eye. For those long drives, available lane departure warning can be key. No more veering off the road (stay alert, and rest — it’s important). This camera will help to prevent collisions, side-swipes, and straying outside of the lines. You’ll even be notified when the truck thinks you’re getting tired and straying away from safe driving habits. On top of that, the XL series has electronic stability control. Bigger trucks require more stability, and ESC (standard on all tractors) will assist automatically when there is a high risk of directional instability. Hino Insight: telematics, remote diagnostics, case management. HinoWatch 24/7 Assistance: Standard for three years, unlimited mileage. You’ll be protected against locking yourself out, battery incidents, warranty towing, and even running out of gas. Hino Care: Preventative maintenance in a convenient program package to make your truck work harder, longer. With these new trucks, we’re entering an entirely new market like nobody ever has before. Check out what our well-versed Hino experts have to say, and contact us today for more information, or to reserve yours.